What’s Needed To Become a Nonprofit Board Change Agent? Be well acquainted with mission arena of the organization — This can range from current or previous employment in the arena or being a board member of an allied organization. The change agent must be able to “walk the talk.” Example: Ask the CEO of a counseling organization whether or not the treatment modalities used by the staff are current. Must have a proactive style — Uninterrupted attendance at most board and committee meetings; asks questions that his/h board colleagues recognize as being perceptive ones; be well respected by peers internally and externally; responds well to the “give or get” policy of the organization and has a professionally cordial relationship with the CEO. Needs to be patient and flexible – The frequent rotation of board personnel may mean that a process of convincing new board members that the change is in the best interest of the nonprofit’s clients. Be ready to change when outside circumstances require a modification of the shape of the effort. Has excellent people skills – He/s will need to understand the various reactions to the change(s) being driven. These can range from board colleagues to management personnel, staff and even external stakeholders like funders. Will “stay on message” in comments related to the change – Will be required to present arguments in a concise and understandable manner. Will be seen as a strong, but not overbearing, champion for the change. Not every nonprofit board change agent will have all the qualifications cited above and all the time necessary to devote to marketing the change. But from those who have succeeded, others need to know what is potentially involved. 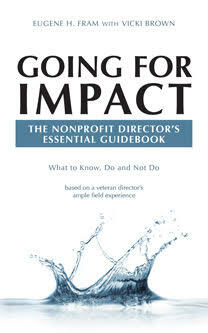 ← Do Directors View Their Nonprofit Boards Through Rose-Colored Glasses? Thanks for the great article Eugene. I would add working with the chair and executive to fine tune the agenda to include generative governance practices; building in conversation prompts that spark debate and critical thinking worthy of change makers; and studying the book at teachings of Governance as Leadership. All in small increments – easier said than done.